Registration for the previously announced live streaming will close on 30 April 2014. The National Genealogical Society (NGS) will broadcast the live streaming of ten lectures from the NGS 2014 Family History Conference.. The upcoming conference will be the first time NGS has provided a portion of the conference to NGS members and others across the United States and overseas who are unable to attend the conference in person. Since the conference offers ten simultaneous tracks, conference attendees may also benefit from live streaming by choosing to attend certain lecture topics of interest in person and using the live streaming program as a chance to view other simultaneous lectures after they return home. The live streaming lectures will be available for delayed viewing for ninety days. Details of the live streaming program can be found at on the NGS Conference website at http://conference.ngsgenealogy.org/attend/live-streaming-at-ngs2014gen/. NGS has selected some of the most popular topics and nationally known speakers for the two featured tracks. Registrants for live streaming can select either track or the bundled package which includes both tracks. • Track One: Records and Research Techniques which can be viewed on Thursday afternoon, 8 May 2014, and Friday morning, 9 May 2014. Join the conference from home and learn about best practices and research sources. • Track Two: Virginia Resources and Migration Patterns which can be viewed on Friday afternoon, 9 May 2014, and Saturday morning, 10 May 2014. Learn about Virginia’s records and her people, who moved south and west to new lands pushing the frontier ever forward. NGS has selected PlayBackNow to broadcast the live sessions and to provide the recorded sessions for later viewing. Instructions for viewing the live streaming will be sent to registrants before 6 May 2014. 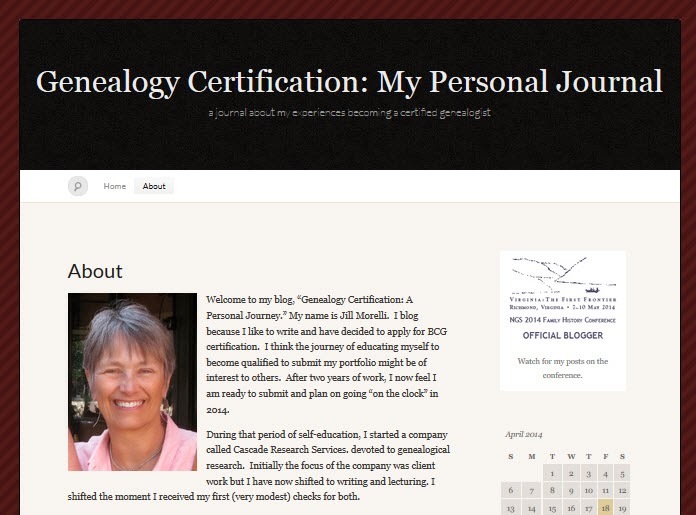 For the "Follow Friday" blog theme I would like to recommend Jill Morelli's blog "Genealogy Certification: My Personal Journal." Jill writes about her educational process as she prepares for certification through the Board for Certification of Genealogists. I met Jill through the ProGen Study Groups and enjoyed getting to know her a little better at the Salt Lake Institute of Genealogy last January. On her blog she sometimes posts her thoughts about the ProGen Study Group assignments, but generally focuses on what she has learned as she studies and prepares to submit her BCG portfolio. As a genealogy education blogger, I appreciate her posts on the conferences and institutes she has attended. It is interesting to hear her perspective. I hope you enjoy reading her blog as much as I do. Upcoming APG Webinars & New "Careers" Series! Mark your calendars! APG has the following webinars and speakers planned for April and May, brought to you by the APG Professional Development Committee. Register soon to reserve your spot. The first webinar is this Thursday! Have you ever considered expanding your services by including House History research? It can be a great way to supplement your business. You might even discover you want to focus on house histories exclusively. In this talk we'll cover the similarities and differences of house history research to genealogy. We'll explore the educational background needed and the main records groups used. Finally, we'll have a discussion of the many different types of clients and products that can be the source of your revenue. Come discover if house history research is in your future! Are you curious about the fast-growing field of forensic genealogy? Forensic genealogist Michael S. Ramage, J.D., CG, will share what led him to specialize in the field of forensic genealogy, and review some of the different types of work which require the expertise of a forensic genealogist. The webinar will also review some of the items individuals need to consider before offering forensic services, including experience, education, credentials, skill sets, and marketing. There are some common mistakes that many genealogists make when developing on online presence whether through email, social media, a blog or their website. From lack of consistency in building a brand to using the wrong image size, Marian Pierre-Louis will help get you back on track. If you would like to have your online presence evaluated (and used in the presentation) send Marian an email. APG members can also submit specific questions on this topic to Marian in advance at rambles@fieldstonehistoricresearch.com. Copyright © 2014 Association of Professional Genealogists, All rights reserved. Are you interested in taking your genealogical research to the next level? Would you like to discuss the Genealogical Proof Standard (GPS) with others in a small group? Do you want to effectively apply the GPS to your own research? Perhaps it’s time for you to begin studying the book Mastering Genealogical Proof by Thomas W. Jones. New rounds of Gen Proof Study Groups are forming now. The small groups of 10-15 members and their mentor will work their way through each chapter of Mastering Genealogical Proof. They will discuss their thoughts, insights and questions about the five parts of the GPS, the chapter exercises and, their own research as it applies to the GPS. 1. Make a commitment. You need to be able to commit at least 10 hours per week to read the book, complete the chapter exercises and participate in discussions. 2. Obtain a copy of Mastering Genealogical Proof. The book is published by the National Genealogical Society and can be ordered here . It is also available as a KindleEdition. 3. Read the first two chapters to understand the commitment you are making. 4. Decide what group level you would like to be in: beginner/intermediate or advanced. There will be a variety of start dates. We use Google + private communities as a platform for the study groups so there will be no expense involved to participate. You need to have a free Google + account. Each Gen Proof study group will have their own private Google + community where they can ask and answer questions and discuss the book content and assignments. The groups will meet in one of four formats selected by the mentor. Asynchronous discussion board-- These groups do not meet at a designated time but have ongoing discussions on a private Google + Community discussion board throughout the week. The mentor will log on each day to answer questions and highlight certain concepts, and participants should check in daily also. Video chat – These groups meet weekly or bi-weekly at a designated time for a one hour video chat on a private Google Hangout. You MUST have a computer or a tablet with a headset and microphone to participate. This is great for those who like to meet in real time and video chat to discuss the subject. Text chat – These groups meet at a designated time for one hour in a private chat room. You type your thoughts and questions via text chat and others will respond and discuss the concepts in real time. This format is good for those who do not want to video chat, but like a designated time each week to meet and discuss the subject. Asynchronous discussion board with option to video chat – This combination of options discussed above has become very popular. To join, click the red “Join Community” button at the top of the page. 2. We will email an application form to those on the waiting list which will include the name of each mentor, their study group start date and format. Participants will reply with a commitment to participate and indicate their first and second choice for study groups. 3. Once the study groups are filled, your mentor will contact you and give you access to the private Google + community or Basecamp website where you will participate in your group discussions. 4. Have fun studying this wonderful new book with a great group of genealogists!